Thoracic spine trauma. Anterior view of multiple spinal cord contusions caused by burst compression fractures of the middle and lower thoracic spine. The goals of diagnostic imaging in patients who have sustained thoracic spinal trauma are to correctly identify spinal fractures, to identify associated injuries to structures that are related to the thoracic spine, to identify injuries to the spinal cord and nerve roots, to aid in surgical planning, and to judge the stability of postoperative fixation. Compression fractures of the thoracic spine occur when a vertical force with or without a flexion or rotational sheer force exceeds the weight-bearing strength of the vertebral body. Various diseases, advanced age, and other comorbidities may make compression fractures more likely. Thoracic spinal fractures remain a common component of trauma in the United States and in other developed nations with high rates of motor vehicle accidents. [12, 13] Mortality due to motor vehicle traffic accidents declined in the United States during 2000-2009,  primarily because of better traffic conditions and improved emergency trauma services. During that same period, the number of deaths due to falls from a height increased. There are 12 thoracic vertebral bodies in the majority of people. The typical thoracic vertebral segment consists of a thoracic vertebral body, right and left transverse processes, a single posterior spinous process, and a right and left superior and inferior facet surface linked to the vertebral body by a pedicle. Each of the thoracic vertebral bodies is linked by the anterior longitudinal ligament, the posterior longitudinal ligament, the ligament flava, and the interspinal ligaments. The typical thoracic vertebral body has facet surfaces for the articulation of a right and left rib. The intervertebral distances between the thoracic vertebral bodies are less than the lumbar segments. A thoracic nerve named for the vertebral segment exits laterally at the same numbered level. Each thoracic nerve root is formed from a ventral and a dorsal nerve root. A dorsal root ganglion is located inferior to the vertebral pedicle of the same number. While most people have 12 ribs, the 12th rib may be rudimentary. Each rib is attached to the vertebral body by 2 joint cavities. The lateral costotransverse ligament, the articular capsule, the superior costotransverse ligament, and the intra-articular ligament provide flexible stability between the transverse process and the rib facets. Depictions of the anatomy of the thoracic spine and vertebra are provided in the images below. Thoracic spine trauma. Drawing of the thoracolumbar spine viewed from an oblique frontal projection. 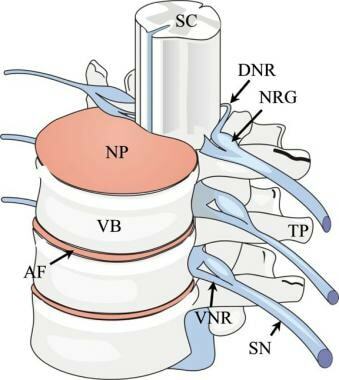 SC indicates the spinal cord; NP, nucleus pulposus; VB, vertebral body; AF, annulus fibrosis; VNR, ventral nerve root; SN, spinal nerve; TP, transverse process; DNR, dorsal nerve root; and NRG, nerve root ganglion. Thoracic spine trauma. Axial drawing of a typical thoracic vertebral body viewed from above. The thoracic vertebral bodies are unique in that ribs articulate by rib facets (red outline and red arrow) with the correspondingly numbered vertebrae. 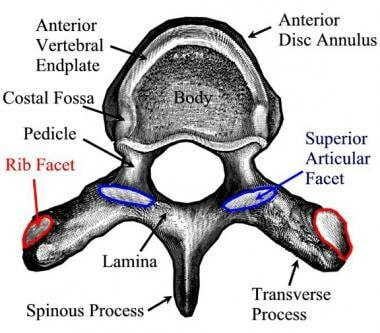 The superior articular facet (outlined in blue, blue arrow) is oriented along a lateral plane. Thoracic spine trauma. Drawing of a typical thoracic vertebral body viewed in a lateral projection. 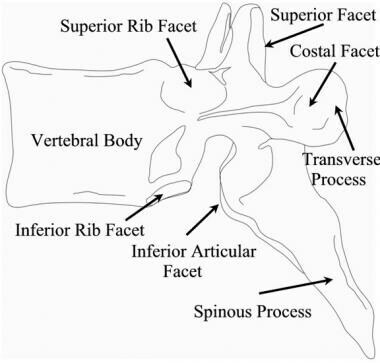 The superior rib facet, semilunar inferior rib facet and the costal facet provide articulation for the ribs. The articular facet surfaces are oriented laterally. The spinous processes of the upper and mid thoracic vertebrae are angulated caudally. Thoracic spine trauma. Sagittal drawing of the thoracic spine demonstrating the structures that comprise the anterior, middle, and posterior columns. ALL indicates the anterior longitudinal ligament; AF, annulus fibrosus; NP, nucleus pulposus; PLL, posterior longitudinal ligament; SSL, supraspinous ligament; LF, ligamentum flavum; and ISL, interspinous ligament. Lateral drawing of the 3 spinal columns of the thoracolumbar junction. The anterior column is indicated by the black dotted line and includes the anterior spinal ligament, the anterior annulus fibrosis and the intervertebral disk, and the anterior two thirds of the vertebral bodies. The middle column (red dotted line) includes the posterior aspect of the vertebral bodies, the posterior annulus fibrosis, and the posterior longitudinal ligament. 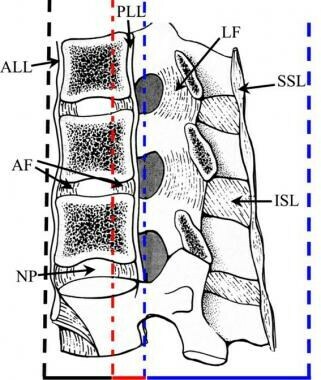 The posterior column (blue dotted line) includes all of the spine posterior to the longitudinal ligament (thick blue dotted line). Thoracic spine trauma. Twelve similar thoracic vertebral bodies form the thoracic spine. A rib is attached to each of the vertebral bodies of the same number. The mild kyphosis of the thoracic spine occurs due to the slightly wedged shape of the anterior thoracic vertebral bodies. Thoracic spine trauma. Posterior drawing of the lower thoracic spine. 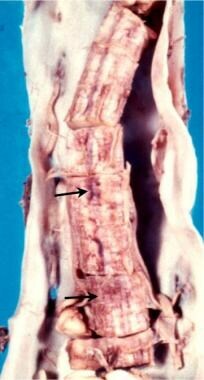 The last rib usually is attached to the 12th thoracic vertebral body. Each thoracic vertebral body articulates with a rib. The facet joints of the thoracic region are oriented in an anterior to posterior direction. 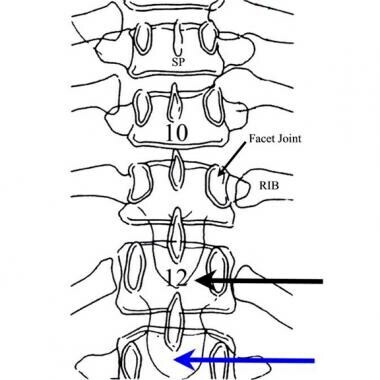 The first lumbar vertebral body (blue arrow) is similar to the last thoracic vertebral body (black arrow) except for the absence of a rib at T12. Thoracic spine trauma. Lateral drawing the spine with the natural spinal curves shown by a curved line. A normal lordotic curve of the cervical spine, a mild kyphosis of the thoracic spine, and lordosis of the lumbar region are noted. These curves act to distribute the vertical weight-bearing load most efficiently. Thoracic spine trauma. The natural lordotic curvature of the cervical spine is reversed in the upper thoracic spine to form a kyphosis in the T1-T2-T3 segments in most adults. Thoracic spine trauma. Axial CT myelogram in a patient with a gunshot wound to the thoracic spine. 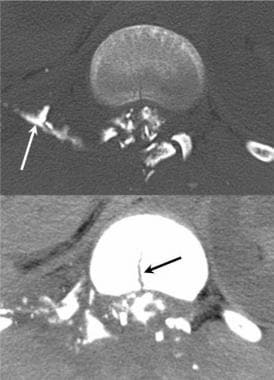 While a fracture is obvious, the injury also resulted in a dural tear with a freely leaking cerebrospinal fluid space (white arrow). 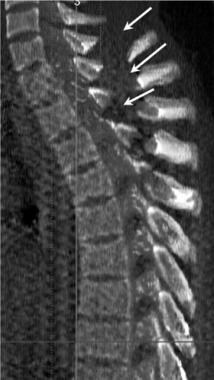 The midline fracture of the vertebral body is noted in the lower image (black arrow). Thoracic spine trauma. Axial CT image demonstrates a complex fracture of the T12 with rotation subluxation. Air was introduced into the epidural space during the injury. Many patients who present with thoracic injury have a pulmonary, rib, or vascular injury. Most patients who have sustained multiple system trauma will have had a CT of the chest and abdomen as part of their evaluation. Pregnant women should be imaged carefully while limiting radiation exposure if possible. The expense and delay of obtaining routine CT scans of the thoracic spine are not justified in all cases. Focused CT scans should be performed if patients have unexplained thoracic back pain or neurological symptoms. A review of the bone windows of thoracic CT scans indicates most major deformities associated with Chance fracture, distraction injury, and burst vertebral fractures. The more complex injuries can be studied later if necessary. Multisectional axial CT of the thoracic region should be reformatted to examine the thoracic spine in a lateral (sagittal) view. The application of MRI in spinal trauma should be linked to an abnormality of the neurologic examination or to an evaluation of unexplained severe spinal pain. The initial evaluation of a patient with a thoracic spinal fracture should account for a possible multisystem trauma pattern (polytrauma). In such cases, possible cranial, abdominal, pelvic, and extremity injuries must be managed. The challenge for the radiologist in polytrauma is to effectively manage the large amount of information obtained by multiple radiographs, CT studies, and MRI scans. Open stabilization remains the most common surgical intervention for the treatment of unstable fractures and dislocations of the thoracic spine. Neurological symptoms and pain remain possible outcomes following open fixation with pedicle screws and rods. Osteoporotic and some pathological fractures can be stabilized with significant pain relief by the performance of a vertebroplasty or a kyphoplasty. 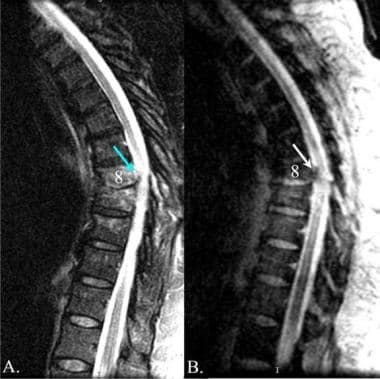 The recognition of the potential anomalous lower than ordinary position of the conus medullaris represents an important potential source of iatrogenic injury during the performance of spinal procedures, including myelography. Radiographic features of an anterior compression (wedge) fracture include soft tissue swelling, anterior superior cortical impaction, loss of vertical height of the anterior vertebral body, buckling of the anterior cortex of the vertebral body, trabecular compaction, endplate fractures, and disk-space narrowing. The radiographic images below display various thoracic spinal traumatic injuries. Thoracic spine trauma. Lateral radiograph of the thoracic spine of a 74-year-old woman. The kyphosis of the thoracic spine is related to osteoporotic failure of the T8 vertebral body. Note the 30-40% wedge-shaped deformity of the T8 vertebra. Thoracic spine trauma. Anteroposterior view radiograph of the lumbar spine demonstrates a narrowed T12 vertebral body height (arrow) consistent with a compression fracture. Thoracic spine trauma. Lateral radiograph of the lumbar spine. 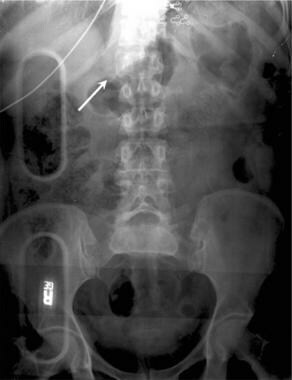 In the upper portion of the lumbar radiograph, a T12 compression fracture (arrow) is demonstrated. Superimposed lung and rib shadows make full depiction of the fracture difficult. Thoracic spine trauma. Lateral radiograph of the thoracic spine with compression fracture (arrow) centered in the image. The radiograph demonstrates a 40% anterior compression of the vertebral body. Thoracic spine trauma. Lateral radiograph of the lumbar spine in a patient with chronic renal disease. Metabolic bone disease, such as renal osteodystrophy (arrow), results in more frequent and more severe compression fractures. Among the more serious injuries of the thoracic spine, the burst fracture usually is detected easily by using standard radiographs of the thoracic spine. In the lateral view, the criteria for instability include a greater than 50% loss of vertebral body height, a greater than 20° angulation of the thoracolumbar junction (normal is 0°), neurologic injury, and a canal narrowing of greater than 30%. Early surgical repair is indicated for such an injury because additional compression of the fracture and more severe neurologic injury can be expected if weight bearing is attempted without surgical fixation. The degree of confidence in the initial identification of thoracic spine fractures is related directly to the severity of the spinal deformity and inversely related to technical factors such as the size of the patient, patient movement, and the type of radiologic equipment available. The degree of compression and changes in the disk interspaces are important factors that help in determining if a compression fracture is clinically significant. A compression with intervertebral disk narrowing of more than 50% has a less favorable prognosis for successful treatment. Beyond acute trauma, anterior wedge fractures are subject to differential diagnostic considerations that include congenital hemivertebra, infections, primary tumors, metastatic tumors, metabolic bone disease, Scheuermann disease, Kummell disease, and Schmorl nodes. Many spinal anomalies may be mistaken for a fracture. Horizontal residual venous sinus grooves may appear as suspected fractures. 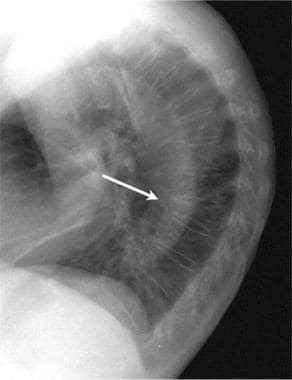 In young children, the anterior corners of the vertebral body may have a small depression, which represents the epiphyseal margin. The ossification centers at the ends of transverse processes may appear as fractures. Ossification centers may be irregular in appearance without pathologic fractures. 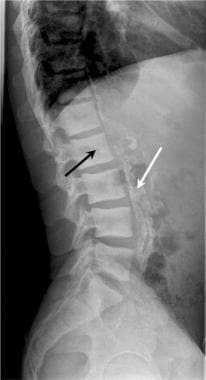 Spina bifida occulta may occur in the posterior spine at any level. The body of T12 is often slightly wedged anteriorly, described as physiologic wedging. Asymmetry of the pedicles of the lower thoracic spine has been reported in 7% of persons without spinal fracture. The best interobserver agreement can be obtained by measuring from the superior endplate of the vertebral body 1 level above the injured vertebral body to the inferior endplate of the vertebral body 1 level below. A congenital butterfly vertebral body appears as a compression fracture viewed in the lateral projection. Superimposed shadows of the glenoid process of the scapula may give a false impression of a compression fracture when viewed in the lateral projection, whereas the outline of the mandible may suggest a fracture in an anterior view. False-positive findings can result from previous (chronic) kyphosis due to osteoporosis or prior injury. Kyphosis after trauma is best compared by using prior lateral radiographs if such images are available. The CT images below display various thoracic spinal traumatic injuries. Thoracic spine trauma. Lateral 3-dimensional maximum intensity projection CT scan of multiple upper thoracic and lower cervical spinous process fractures. The force necessary to fracture the spinous processes of the upper thoracic spine may also involve the lower cervical spine. Thoracic spine trauma. Three-dimensional CT scan of complex midface fractures including a Le Fort I injury in a patient who had fractures of the upper thoracic and lower cervical spinous processes. 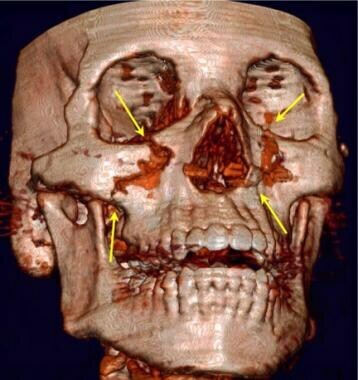 Sudden deceleration of the face and skull resulted in severe stress forces on the spinous processes. Thoracic spine trauma. 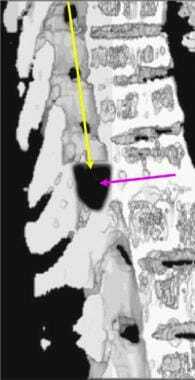 Axial CT scan of a T12 compression fracture demonstrates a fracture line through the anterior body of the T12 (white arrow), posterior displacement of the T12 vertebral endplate (black arrow) into the spinal canal, and a fracture of the left transverse spinous process. Thoracic spine trauma. 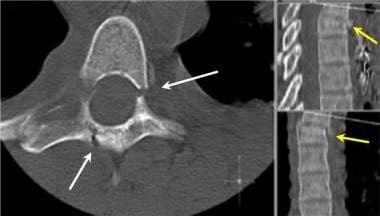 Axial and sagittal CT images of an acute lower thoracic spine compression fracture. Note the paraspinal hematoma (white arrows) and the slight narrowing of the spinal canal at the level of the compression fracture (double yellow arrows). Thoracic spine trauma. 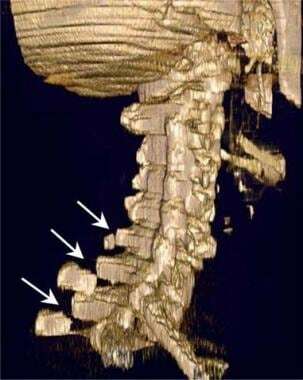 Three-dimensional CT scan of the thoracic spine demonstrates a compression fracture. Thoracic spine trauma. Sagittal CT scan of the thoracic and lumbar spine demonstrates a complete distraction fracture at the L1-2 interspace (arrow). Thoracic spine trauma. Axial CT image of an unstable fracture of the thoracic spine. Note the association of compression of the vertebral body with laminar and pedicle fractures. Injury to the anterior, middle, and posterior columns results in an unstable fracture. Thoracic spine trauma. Coronal multiplanar reformatted CT images of an unstable thoracic spinal fracture. The association of both anterior compression and lateral subluxation (arrows) indicates instability. Thoracic spine trauma. Volume maximum intensity projection CT image of the entire thoracic spine demonstrates spinous process fractures of the C7 through T7 vertebra. Although spinous process fractures of the T1 may occur in a manner similar to a clay shoveler's fracture of the C6 or C7, middle and lower thoracic spinous process fractures most likely occur due to a combination of forward flexion and axial rotation. Note the lack of findings of compression vertebral body fractures. Thoracic spine trauma. 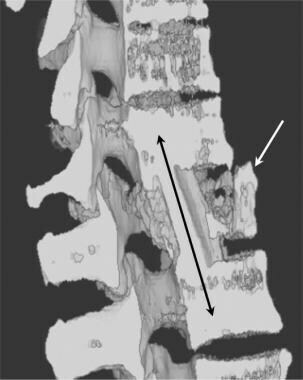 Three-dimensional surface CT image of the cervical spine. Note the spinous process fractures of the C6, C7, and T1. CT examination of both the cervical and the thoracic spine was obtained as a single study using a multisection CT scanner. All images were obtained by using a 3-mm reconstruction with 1.5-mm collimation. Scanning times were 0.5 seconds per rotation. These 3-dimensional images were reconstructed by using an independent imaging workstation. In complex cases, reconstructed images are very useful in consultation with treating physicians. Thoracic spine trauma. Scout view image from a spiral CT scan shows a complete subluxation fracture (curved blue lines) of the lower thoracic spine. Such an injury combines lateral displacement with rotational injury (arrow). Thoracic spine trauma. Fracture dislocation of the lower thoracic spine. Axial CT image demonstrates the large distance that the lower thoracic spine has been displaced. Thoracic spine trauma. Sagittal multiplanar CT image of a burst fracture following fixation. The image has been cut in the sagittal plane. 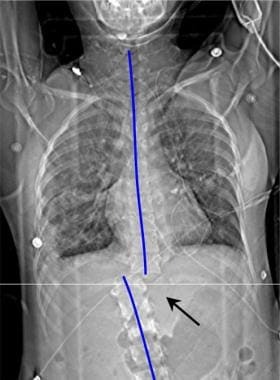 Surgical repair of unstable thoracic spine fractures, such as this burst fracture, usually involves placement of an interposition graft (double black arrow) together with a lateral plate held in position by screws placed into the vertebral body above and below the injury. A residual fragment of the burst fracture is seen anteriorly (white arrow). The double white arrow illustrates the restored spinal canal. Thoracic spine trauma. 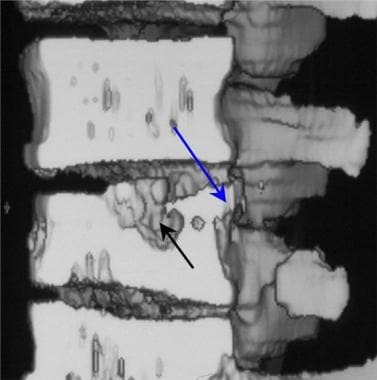 Shaded-surface 3-dimensional CT image of a burst fracture following fixation. The image has been cut in the sagittal plane. 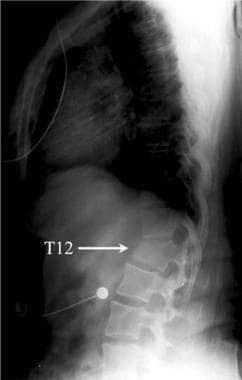 Surgical repair of unstable thoracic spine fractures, such as this burst fracture, usually involves placement of an interposition graft (double black arrow) together with a lateral plate held in position by screws placed into the vertebral body above and below the injury. A residual fragment of the burst fracture is seen anteriorly (white arrow). Thoracic spine trauma. Shaded-surface 3-dimensional CT image of a gunshot wound to the thoracic spine. Although the bullet passed into the interspace, causing a fracture of the vertebral body, the bullet stopped within the spinal canal. Note the outline drawn around the bullet (arrow). Thoracic spine trauma. Shaded-surface 3-dimensional CT scan of a gunshot wound to the thoracic spine. In other cases, the bullet may enter the spinal canal superior to the final position in the canal. 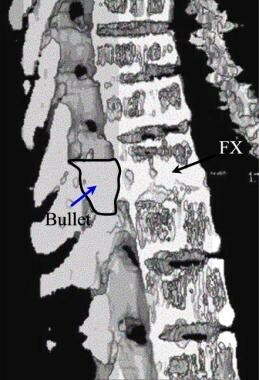 The passage of the bullet within the spinal canal (yellow arrow) destroys the spinal cord and also may result in a fracture of the vertebral body. Note that the bullet has been darkened (blue arrow). Thoracic spine trauma. Axial CT image in a man with known pulmonary tuberculosis and back pain. Note the left-sided paraspinal abscess (arrow). Thoracic spine trauma. Sagittal shaded-surface 3-dimensional reconstruction CT scan of the lower thoracic spine. The spinal image has been cut in the midsagittal plane to demonstrate posterior displacement of the thoracic spinal vertebral body (arrow) and downward displacement of the superior endplate. Note the general wedge shape of the vertebral body. The level of a burst fracture and the percentage of spinal canal stenosis have been correlated with associated neurologic deficits. A significant correlation exists between neurologic deficit and the percentage of spinal canal stenosis. The higher the level of injury, the greater the probability of neurologic deficit. This association may be related to the smaller canal diameter in the upper thoracic spine. The severity of neurologic deficit cannot be predicted. The confidence level for the diagnosis of a thoracic spinal fracture with 2-mm axial sections (possible with a multisection CT unit) is greater than 98% and reportedly 99%. Because axial CT is performed with the patient in a neutral position, bony distraction of the fracture fragments and subluxations of the spinal articulations may not be as significant on CT images as on acute trauma-series radiographs. False-positive results may occur in patients with a Schmorl node, which is a chronic internal herniation of the vertebral disk into the thoracic vertebral body endplate and failure of the fusion of the anterior vertebral endplate epiphysis, resulting in a limbus vertebra. False-negative CT studies may occur in chronic stress injuries and in severe generalized osteoporotic endplate fractures. 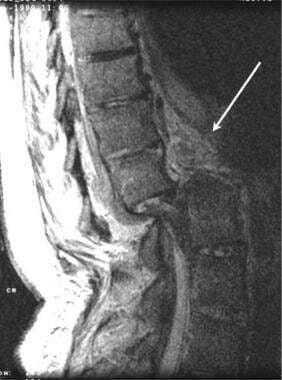 Thoracic spinal MRI can demonstrate many vertebral fractures and most abnormalities of alignment. The patterns of injury are similar to those demonstrated on radiographs. MRI is superior to both radiography and CT in the detection of soft tissue injury to the ligaments, facet capsules, and prevertebral spaces. Integrity of the posterior ligamentous complex is one of the three aspects of thoracolumbar injury, along with injury morphology and the neurological status of the patient, that make up the Thoracolumbar Injury Classification and Severity Score (TLICS). [33, 34] TLICS scores have been proposed as a guideline for management of thoracolumbar injuries. MRI is unique in the ability to depict epidural bleeding and spinal cord injury. Injury to the thoracic cord is particularly critical because such injury may result in paralysis. However, MRI has fewer line pairs of resolution than does CT, which makes MRI a secondary method for fracture evaluation. 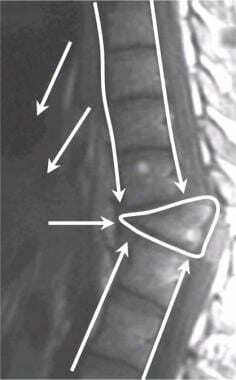 The images below display thoracic spinal injuries on MRI. Thoracic spine trauma. Sagittal MRIs in a patient with acute spinal injury resulting from a motor vehicle accident. A, Fast spin-echo MRI demonstrates a combined fracture compression of vertebral bodies of T8 and T9. A small fragment of bone compromises the spinal canal and is in contact with the spinal cord. 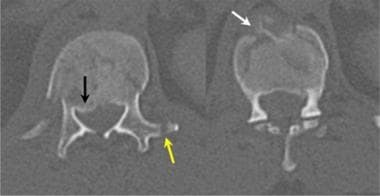 B, Gradient-echo T2-weighted image better defines the bone fragment within the canal (arrow). This fracture was associated with a partial spinal cord injury in which loss of motor function occurred with preservation of distal sensory function. Thoracic spine trauma. Sagittal MRIs of the thoracic spine in a patient who had a complete spinal cord injury. A, Sagittal fast spin-echo T2-weighted MRI demonstrates disruption of the anterior longitudinal ligament (white arrow) and a wide distraction of the T9-T10 facets joints (yellow arrow). 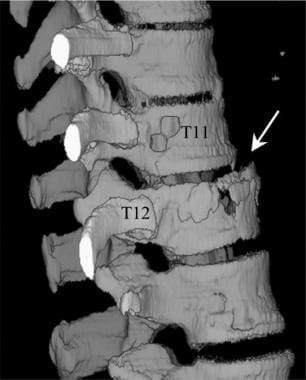 The spinal cord between T8-T9 and T9-T10 is disrupted with poorly defined margins. B, Sagittal gradient-echo T2-weighted MRI demonstrates the ligamentous injuries anteriorly (white arrow) and posteriorly (black arrow). Thoracic spine trauma. Sagittal T1-weighted MRI image of a compression fracture of the lower thoracic spine. The forces causing a Chance fracture include vertical loading and forward rotation around a fixation point, which often is a seatbelt. Thoracic spine trauma. Gradient-echo T2-weighted sagittal MRI image of a compression fracture. The T12 vertebral body has lost vertical height (white arrow). 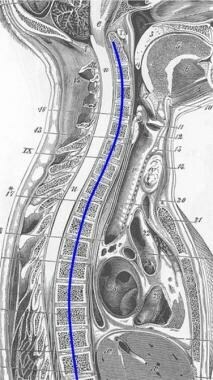 The spinal canal has been narrowed. Note the disruption of the posterior spinal ligaments (black arrow). Thoracic spine trauma. Chance fracture of the T12 resulting in lower thoracic cord injury. Note the edema of the lower thoracic spinal cord (arrow) resulting from the T12 fracture and the associated hyperflexion injury. Thoracic spine trauma. 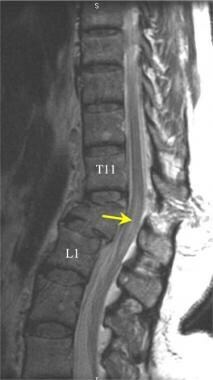 Axial T1-weighted MRI image of the thoracic spine in a patient with a burst injury of the T12 vertebral body. 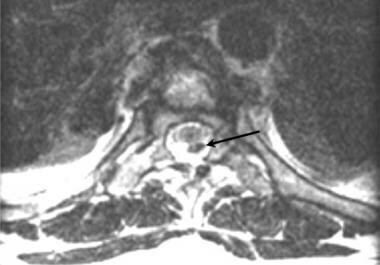 A large bone fragment has entered the spinal canal resulting in posterior displacement of the conus (arrow). Thoracic spine trauma. 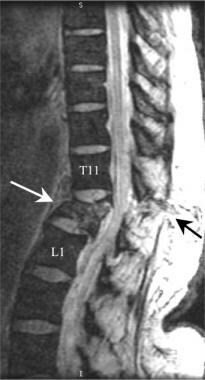 Sagittal T2-weighted MRI of the thoracolumbar junction demonstrates a complete dislocation at the T12-L1 interspace (arrow). With a T2-weighted gradient-echo technique, the cortical break can be demonstrated in some fractures. MRI is superior to CT in the identification of the indirect signs of a fracture, such as paraspinal edema or hemorrhage, epidural bleeding, and sprains of the paraspinal and intraspinal ligaments. A gradient-echo sagittal T2-weighted MRI of the spine demonstrates compression fractures by showing the cortical bone as dark (black), while the T2-weighted quality shows cerebrospinal fluid and spinal cord edema as bright (white). Subacute hemorrhage within the spinal cord or in the epidural space may be seen as a susceptibility area of lost signal brightness. Thoracic spine MRIs demonstrate many vertebral fractures and most abnormalities of alignment. MRI is superior to CT in the identification of indirect signs of a fracture, such as perivertebral edema or hemorrhage, epidural bleeding, and sprains of the paraspinal and intraspinal ligaments. Associated injuries to intracranial structures are evaluated better by using MRI than CT imaging. False-positive MRI results are often associated with movement artifacts of metal near the site of injury. Blood-vessel canals may mimic bone injury. The use of upper cervical and intracranial magnetic resonance angiography may help in differentiating certain vascular variations. False-negative findings may result from motion on the part of the patient. 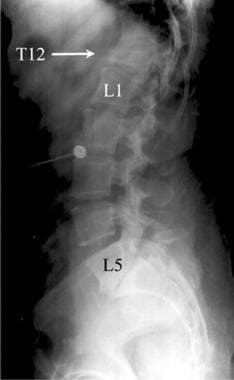 Artifacts related to implanted metal may mask spinal fractures. In older patients or in patients with known neoplastic disease, a pathologic fracture should be considered. In these patients, MRI with Gd-DTPA enhancement will demonstrate a spinal mass or osteomyelitis. MRI has less line-pair resolution than does CT scanning. With T2-weighted gradient-echo sequences, the cortical break can be demonstrated in some fractures; however, even with adequate MRI technique, minimally displaced fracture lines may not be seen by using MRI. The use of thoracic ultrasonography is usually limited to the localization of pleural effusions, which may occur after significant thoracic spinal and chest wall injury. Diagnostic thoracentesis is more easily performed by using sonographic guidance. 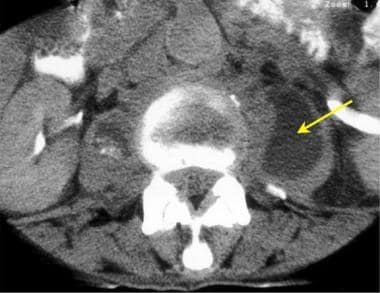 Paraspinal abscess may be localized prior to aspiration in select patients. As a result of the limitations of sonographic studies of bone and the lungs, sonography should be used only in specific patients. Ultrasound does not penetrate the air in the lungs or the bones of the spine and ribs. Ultrasonography may be applied in select patients for localization studies. Nuclear medicine studies have a limited role in the acute phase of thoracic spine injury; however, in a possible congenital anomaly, an acute fracture can be differentiated from a limbus vertebra. After 12-24 hours, a bone scan with technetium-99m hydroxydimethylpyrimidine demonstrates increased uptake in the area of a fracture. Later in the clinical course, persistent back pain may be explained by a nondisplaced facet injury or pedicle fracture, which is also associated with an area of increased uptake. After surgery or in open spinal fractures, diskitis and osteomyelitis can be identified by focal areas of increased activity; however, indium 111–tagged white blood cells (WBCs) act as a more specific agent in the detection of abscess and osteomyelitis. Unfortunately,111 In-tagged WBC scans have a poor sensitivity for the detection of diskitis. Fat-saturated T1-weighted MRI with intravenous gadolinium enhancement may demonstrate the enhancement of osteomyelitis or diskitis, even in cases in which the111 In WBC scan was negative. MRI is also superior in the detection of an associated epidural abscess. In cases in which MRI is contraindicated (pacemaker, aneurysm clip, etc) or in the presence severe MRI artifacts resulting from fixation plates, wires, or screws, a combined99m Tc hydroxydimethylpyrimidine-gallium scan is recommended. In all patients, the tomographic qualities of single-photon emission computed tomography (SPECT) improve both accuracy and specificity. In the absence of prior surgery, radionuclear bone imaging is fairly sensitive. If bone scans are needed, SPECT should be applied in all patients with suspected upper thoracic spine trauma. False-negative results may occur in the first hours after an acute trauma. If possible, 24 hours should be allowed to pass prior to attempting nuclear bone scans of the thoracic spine. Angiography has a limited and indirect but critical role in the assessment of thoracic spinal injury. After a gunshot wound to the chest, injuries to the aorta and the proximal great vessels are best evaluated by using angiography. New higher-resolution CT angiography makes catheter angiography less essential. Evaluation of injury to the aorta, subclavian arteries, and innominate artery are routinely performed during the assessment of patients with multisystemic trauma. Trauma, including arterial laceration with hemorrhage, may be seen in association with displaced rib and transverse-process fractures. The higher resolution of digital subtraction angiography results in excellent image quality. Rarely are other vascular images necessary. Use of angiography is typically reserved for possible interventional repair of arterial injuries and in patients in whom the diagnosis is confused. Standing waves within the proximal carotid artery or innominate artery may mimic vascular injury with spasm. In the older adult, arteriosclerotic vascular disease may mimic spasm. Intercostal arteries may be in spasm at the time of an examination, preventing localization of a bleeding site. Miller JH, Zywicke HA, Fleming JB, et al. Neurosurgical injuries resulting from the 2011 tornados in Alabama: the experience at the University of Alabama at Birmingham Medical Center. J Neurosurg. 2013 Jun. 118(6):1356-62. [Medline]. Schoenfeld AJ, Newcomb RL, Pallis MP, et al. Characterization of spinal injuries sustained by American service members killed in Iraq and Afghanistan: a study of 2,089 instances of spine trauma. J Trauma Acute Care Surg. 2013 Apr. 74(4):1112-8. [Medline]. Diaz JJ Jr, Cullinane DC, Altman DT, et al. Practice management guidelines for the screening of thoracolumbar spine fracture. J Trauma. 2007 Sep. 63(3):709-18. [Medline]. Rosinczuk-Tonderys J, Zaluski R, Gdesz M, Lisowska A. Spine and spinal cord injuries--causes and complications. Adv Clin Exp Med. 2012 Jul-Aug. 21(4):477-85. [Medline]. Junewick JJ, Borders HL, Davis AT. Pediatric thoracic spine injuries: a single-institution experience. AJR Am J Roentgenol. 2014 Sep. 203 (3):649-55. [Medline]. Jawa RS(1), Singer AJ(2), Rutigliano DN(1), McCormack JE(1), Huang EC(1), Shapiro MJ(1), et al. Spinal Fractures in Older Adult Patients Admitted After Low-Level Falls: 10-Year Incidence and Outcomes. J Am Geriatr Soc. 2016 Dec 2. 2016 Dec 2.:doi: 10.1111/jgs.14669. [Medline]. Rozenberg A(1), Weinstein JC(2), Flanders AE(2), Sharma P(2). 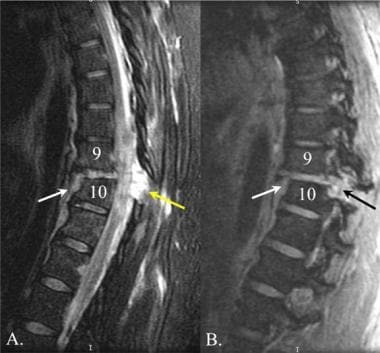 Imaging of the thoracic and lumbar spine in a high volume level 1 trauma center: are reformatted images of the spine essential for screening in blunt trauma?. Emerg Radiol. 2016 Sep 23. 10.1007/s10140-016-1445-7:[Medline]. Sloane CM, Chan TC, Vilke GM. Thoracic spine compression fracture after TASER activation. J Emerg Med. 2008 Apr. 34(3):283-5. [Medline]. Jauregui JJ(1), Perfetti DC, Cautela FS, Frumberg DB, Naziri Q, Paulino CB. Spine Injuries in Child Abuse. J Pediatr Orthop. 2016 Sep 22. Epub ahead of print:10.1097/BPO.0000000000000877. [Medline]. Altun I(1), Yuksel KZ(1). Ankylosing Spondylitis: Patterns of Spinal Injury and Treatment Outcomes. Asian Spine J. 2016 Aug;10. (4):655-62. [Medline]. Denaro V(1), Denaro L(2), Albo E(1), Papapietro N(1), Piccioli A(3), Di Martino A(4). Surgical management of spinal fractures and neurological involvement in patients with myeloma. Injury. 2016 Oct. 47 Suppl 4:S49-S53. [Medline]. El-Faramawy A, El-Menyar A, Zarour A, et al. Presentation and outcome of traumatic spinal fractures. J Emerg Trauma Shock. 2012 Oct. 5(4):316-20. [Medline]. [Full Text]. Bingol O, Ayrik C, Kose A, et.al. Retrospective analysis of whole-body multislice computed tomography findings taken in trauma patients. Turk J Emerg Med. 2015 Dec 30. 15(3):116-21. [Medline]. Rockett IR, Regier MD, Kapusta ND, et al. Leading causes of unintentional and intentional injury mortality: United States, 2000-2009. Am J Public Health. 2012 Nov. 102(11):e84-92. [Medline]. [Full Text]. Marshall RT(1), Kotecha H(2), Chiba T(3), Tennyson J(3). Thoracic Spine Fracture in a Survivor of Out-of-Hospital Cardiac Arrest with Mechanical CPR. Prehosp Disaster Med. 2016 Dec; 31. (6):684-686. [Medline]. Khoynezhad A, Azizzadeh A, Donayre CE, Matsumoto A, Velazquez O, White R. Results of a multicenter, prospective trial of thoracic endovascular aortic repair for blunt thoracic aortic injury (RESCUE trial). J Vasc Surg. 2013 Apr. 57(4):899-905.e1. [Medline]. Stahel PF, VanderHeiden T, Flierl MA, et al. The impact of a standardized "spine damage-control" protocol for unstable thoracic and lumbar spine fractures in severely injured patients: a prospective cohort study. J Trauma Acute Care Surg. 2013 Feb. 74(2):590-6. [Medline]. Mosquera VX, Marini M, Muniz J, et al. Blunt traumatic aortic injuries of the ascending aorta and aortic arch: A clinical multicentre study. Injury. 2013 Jan 4. [Medline]. Mirhosseini SM, Asadollahi S, Fakhri M. Surgical management of traumatic rupture of aortic isthmus: a 25-year experience. Gen Thorac Cardiovasc Surg. 2013 Apr. 61(4):212-7. [Medline]. Biglari B(1), Child C(2), Yildirim TM(2), Swing T(2), Reitzel T(1), Moghaddam A(2). Does surgical treatment within 4 hours after trauma have an influence on neurological remission in patients with acute spinal cord injury?. Ther Clin Risk Manag. 2016 Aug 31. 12:1339-46. [Medline]. Fontijne WP, de Klerk LW, Braakman R, Stijnen T, Tanghe HL, Steenbeek R. CT scan prediction of neurological deficit in thoracolumbar burst fractures. J Bone Joint Surg Br. 1992 Sep. 74(5):683-5. [Medline]. Barrios C, Malinoski D, Dolich M, Lekawa M, Hoyt D, Cinat M. Utility of thoracic computed tomography after blunt trauma: when is chest radiograph enough?. Am Surg. 2009 Oct. 75(10):966-9. [Medline]. 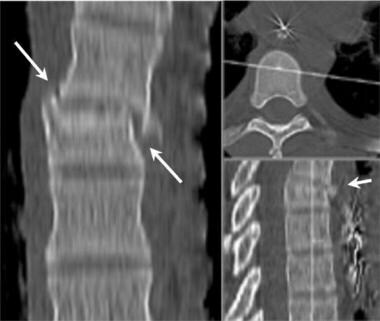 Bernstein MP, Mirvis SE, Shanmuganathan K. Chance-type fractures of the thoracolumbar spine: imaging analysis in 53 patients. AJR Am J Roentgenol. 2006 Oct. 187(4):859-68. [Medline]. Luszczyk MJ, Blaisdell GY, Wiater BP, Bellabarba C, Chapman JR, Agel JA. Traumatic dural tears: what do we know and are they a problem?. Spine J. 2013 May 10. [Medline]. Bartalena T, Giannelli G, Rinaldi MF, et al. Prevalence of thoracolumbar vertebral fractures on multidetector CT: underreporting by radiologists. Eur J Radiol. 2009 Mar. 69(3):555-9. [Medline]. Brightman RP, Miller CA, Rea GL, Chakeres DW, Hunt WE. Magnetic resonance imaging of trauma to the thoracic and lumbar spine. The importance of the posterior longitudinal ligament. Spine (Phila Pa 1976). 1992 May. 17(5):541-50. [Medline]. Park MS, Moon SH, Yang JH, Lee HM. Neurologic recovery according to the spinal fracture patterns by Denis classification. Yonsei Med J. 2013 May 1. 54(3):715-9. [Medline]. [Full Text]. 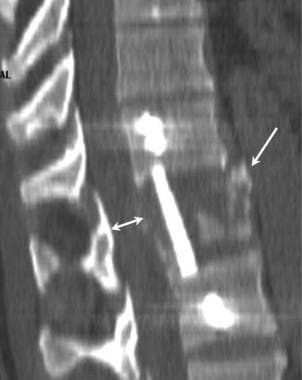 Sroka NL, Combs J, Mood R, Henderson V. Scout anteroposterior and lateral CT scans as a screening test for thoracolumbar spine injury in blunt trauma. Am Surg. 2007 Aug. 73(8):780-5; discussion 785-6. [Medline]. Dai LY, Wang XY, Jiang LS, Jiang SD, Xu HZ. Plain radiography versus computed tomography scans in the diagnosis and management of thoracolumbar burst fractures. Spine (Phila Pa 1976). 2008 Jul 15. 33(16):E548-52. [Medline]. Deunk J, Dekker HM, Brink M, van Vugt R, Edwards MJ, van Vugt AB. The value of indicated computed tomography scan of the chest and abdomen in addition to the conventional radiologic work-up for blunt trauma patients. J Trauma. 2007 Oct. 63(4):757-63. [Medline]. Burns JE, Yao J, Muñoz H, Summers RM. Automated Detection, Localization, and Classification of Traumatic Vertebral Body Fractures in the Thoracic and Lumbar Spine at CT. Radiology. 2015 Jul 14. 142346. [Medline]. Carter B, Griffith B, Mossa-Basha F, Zintsmaster SA, Patel S, Williams TR, et al. 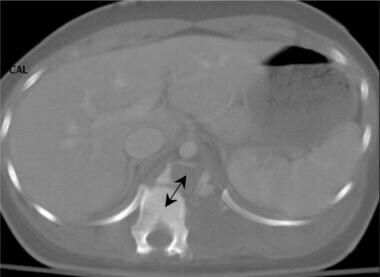 Reformatted images of the thoracic and lumbar spine following CT of chest, abdomen, and pelvis in the setting of blunt trauma: are they necessary?. Emerg Radiol. 2015 Aug. 22 (4):373-8. [Medline]. Lee JY, Vaccaro AR, Lim MR, et al. Thoracolumbar injury classification and severity score: a new paradigm for the treatment of thoracolumbar spine trauma. J Orthop Sci. 2005 Nov. 10(6):671-5. [Medline]. [Full Text]. Patel AA, Vaccaro AR, Albert TJ, et al. The adoption of a new classification system: time-dependent variation in interobserver reliability of the thoracolumbar injury severity score classification system. Spine (Phila Pa 1976). 2007 Feb 1. 32(3):E105-10. [Medline]. Sapkas G, Kateros K, Papadakis SA, et al. Surgical outcome after spinal fractures in patients with ankylosing spondylitis. BMC Musculoskelet Disord. 2009 Aug 2. 10:96. [Medline]. [Full Text]. Chance CQ. Note on a type of flexion fracture of the spine. Br J Radiol. 1948. 21:452-3. Grados F, Fechtenbaum J, Flipon E, Kolta S, Roux C, Fardellone P. Radiographic methods for evaluating osteoporotic vertebral fractures. Joint Bone Spine. 2009 May. 76(3):241-7. [Medline]. Lenarz CJ, Wittgen CM, Place HM. Management of a pregnant patient with a burst fracture causing neurologic injury. A case report. J Bone Joint Surg Am. 2009 Jul. 91(7):1747-9. [Medline]. Marco RA, Kushwaha VP. Thoracolumbar burst fractures treated with posterior decompression and pedicle screw instrumentation supplemented with balloon-assisted vertebroplasty and calcium phosphate reconstruction. J Bone Joint Surg Am. 2009 Jan. 91(1):20-8. [Medline]. Pflugmacher R, Agarwal A, Kandziora F, K-Klostermann C. Balloon kyphoplasty combined with posterior instrumentation for the treatment of burst fractures of the spine--1-year results. J Orthop Trauma. 2009 Feb. 23(2):126-31. [Medline]. Veeravagu A, Jiang B, Rincon F, Maltenfort M, Jallo J, Ratliff JK. Acute respiratory distress syndrome and acute lung injury in patients with vertebral column fracture(s) and spinal cord injury: a nationwide inpatient sample study. Spinal Cord. 2013 Mar 12. [Medline]. Wang Y, Zhang QF, Pang QJ, Ge ZB. [Clinical study thoracolumbar Chance fractures: a report of 21 cases]. Zhongguo Gu Shang. 2008 Jul. 21(7):550-1. [Medline]. Winslow JE, Bozeman WP, Fortner MC, Alson RL. Thoracic compression fractures as a result of shock from a conducted energy weapon: a case report. Ann Emerg Med. 2007 Nov. 50(5):584-6. [Medline]. Thoracic spine trauma. Lower cervical spine facet fracture. Multiple spinal injuries may occur in a single patient due to the similarity of the mechanisms of injury that affect the lower cervical spine and the upper thoracic spine. Thoracic spine trauma. Drawing of a Chance fracture of the thoracic lumbar junction. The defect follows an irregular horizontal plane (arrows), which results in disruption of the anterior (black dotted line), the middle column (red dotted line), and the posterior column (blue dotted line). Thoracic spine trauma. Drawing illustrates the mechanism of injury causing a Chance fracture. Thoracic spine trauma. Three-dimensional volume image of the thoracic and lumbar spine demonstrates a fracture dislocation of the T11-T12 vertebrae. Thoracic spine trauma. Epidural air (black arrow) is noted, as is gas in the muscular layers of the neck (white arrows). Thoracic spine trauma. Coronal shaded-surface display of a compression fracture. Note the downward displacement of the vertebral body endplate (double blue arrow) and the small central cold abscess (black arrow). Thoracic spine trauma. Microscopic image of a smear from a paravertebral abscess aspirate. Note the red stain associated with tuberculosis. Tuberculosis is one of the more common causes of spinal compression fracture in the underdeveloped nations of Asia and the Far East (acid-fast stain, magnification X100). Sagittal MRP CT of the Thoracic Spine. This fracture dislocation of T11 on T12 demonstrates a jumped locked facet of T11 on T12. The authors and editors of Medscape Reference gratefully acknowledge the contributions of previous author James A Moody, MD, to the development and writing of this article.